Pick up from your hotel in Saigon and depart for Mekong Delta. Arrival Mekong Delta we will board our sampan for an exploration of lush vegetation of Mekong Delta and the lively Cai Be floating market. Walking for visit the handicraft village of the local people. Sightseeing the old house and sample various tropical fruits. Return to our boat.Our boat sets sail and cruise through zizag cannales and river heading out to Cantho via Cho LACH while we enjoy lunch on board. Arrival Cho LACH village we will go for a pleasant walking or biking on the footpaths of the countryside to discover tropical fruit orchards and the local people\’s activities,especially somes orchards (orange grove) with its famer. Interaction with friendly people and meet with a host of smiling children. Our cruise continues to Traon. Enjoy the magnificent sunset on the river. Leisurely cruise up the Mekong River while enjoying the beautiful scenery and the aperitifs, sunset cruise. A wonderful day with picturesque ferry crossings over Mekong River branches .Dinner and night e on board Le Cochinchine in TRAON. The morning bobbling commotion of Mekong river life comes to life for another lovely day we breakfast and set sails to Can Tho through tributary and canals. Enjoy the magnificent sunrise on Bassac river. A small boat will take you to CaiRang floating market. One of the most bustling floating markets in Mekong Delta with hundreds of small boats bargaining and jostling for space as owners attempt to sell their goods. And through the palm-shaded creek local houses and green orchards comes into your view. Leisurely cruise down the Mekong River while enjoying the beautiful scenery and the aperitifs, sunset cruise on board Le Cochinchine.Dinner and overnight on board. Rising up early for another nice day, we contemplate sunrise while having breakfast on board. Visit Longxuyen floating market by small boats intermingled through the water as vendors buy and sell their fruit. Visit a crocodile farm and promenade on OngHo island, see daily life of the local people who live on both sides of the Mekong (Bassac river), and small arroyos on the island. Noon approaching we return to Le Cochinchine boat and carry on our journey to HoaHao village. Lunch on board. Disembark and head to Chaudoc. Tonight we stay overnight at Victoria Chaudoc hotel in Chaudoc. This morning we will have a boat ride from Chau Doc to Phnom Penh departing at 8am. The boat takes us along the Mekong River. It continues on to the Vietnamese (Vinh Xuong) – Cambodian (Kaom Samnar) border and then to Phnom Penh, capital of Cambodia. The journey takes approximately 4 hours. Arrival transfers our hotel in Phnompenh, the capital of Kingdom of Cambodia. A visit to Phnom Penh is a very interesting experience indeed. It is a city with an interesting pulse and it gives you a very true taste of Asia. We will visit the Wats Phnom, National museum, silver Pagoda and Royal Palace. Stay overnight at Sunway hotel in Phnom Penh. This morning there will be a transfer to Phompenh port for the boat ride to Siemriep. The boat winding our way on Tonle Sap River, taking in such spectacular view of rural life on water. Arrival Siemriep, transfer to the hotel .Visit Prasat Kravan with its unique brick sculptures and Ta Prohm. One of the area\’s most beautiful temples, Ta Prohm has been relatively untouched since it was discovered and retains much of its mystery. Its appeal lies in the fact that, unlike the other monuments of Angkor, it was abandoned and swallowed by the jungle, looking very much the ways most of the Angkor temples appeared when European explorers first stumbled upon them. Visit as well Takeo, Chau Say Tevoda and Thommanon. Have dinner and overnight at Prince d’Angkor hotel. Have breakfast at hotel. In the morning, visit the most famous of all the temples on the plain of Angkor: Angkor Wat. The temple complex covers 81 hectares and is comparable in size to the Imperial Palace in Beijing. Its distinctive five towers are emblazoned on the Cambodian flag and the 12th century masterpiece is considered by art historians to be the prime example of classical Khmer art and architecture. Angkor Wat\’s five towers symbolize Meru\’s five peaks – the enclosed wall represents the mountains at the edge of the world and the surrounding moat, the ocean beyond. 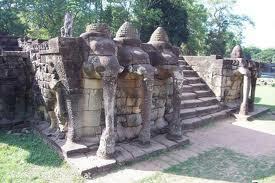 At leisure to visit the market or “Les Artisans d\’Angkor – Chantiers Ecoles” of Siem Reap (if time permits). Transfer to Siem Reap International Airport for departure flight to the next destination. Boat ride from Chaudoc to Phnompenh-Phnompenh -Siemreap. Service of crew and English speaking guide on board. Travel insurance, Visa fee (Visa fee on arrival at Cambodia border: 25USD, 1 photo 3x4cm).